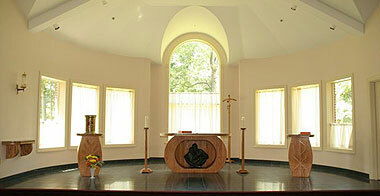 The chapel of the McShain-Horstmann Center at Malvern Retreat House. When Archbishop Charles Chaput celebrates Mass for the 100th Anniversary of Malvern Retreat House at 11 a.m. on Sunday, Oct. 28 at the Cathedral Basilica of SS. Peter and Paul, it really is a big deal. Malvern’s St. Joseph’s in the Hills is the largest and most active Catholic retreat facility in the country and very possibly the world. Big things almost always have a modest beginning, and that certainly is the case with Malvern. Technically the real celebration is for the establishment of what would ultimately become Laymen’s Retreat League of Philadelphia, which owns and operates Malvern. In 1912 John Ferreck, a Philadelphia investment broker, was in New York on business and forced to stay over the weekend. He happened to see a flyer in Old St. Patrick’s Church advertising a men’s retreat that would be conducted that weekend by Jesuit Father Terence Shealy at Mount Manresa on Staten Island. With nothing better to do, Ferreck attended the retreat, which was a real eye-opener, because Father Shealy was the true founder of the retreat movement in the U.S.
Ferreck was on fire when he came home to Philadelphia, and he convinced St. Charles Borromeo Seminary Rector Father Henry Drumgoole, with the permission of Archbishop Edmond Prendergast, to allow the use of the seminary for weekend laymen’s retreats conducted by Father Shealy during the seminarians’ summer break. 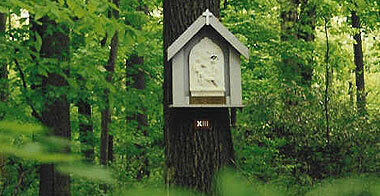 A panel of the Stations of the Cross along a wooded path at Malvern Retreat House. The weekend retreats proved to be an instant success. Key to this was the early focus on the business community, because the friends Ferreck first recruited were like himself leaders in the Catholic community who could encourage others, often as not their own employees, to make the retreat. Although the retreats were successful, there was a limitation on how many could be accommodated because of size and short window of availability of the seminary. It was Cardinal Dennis Dougherty, Philadelphia’s next archbishop, who suggested the laymen really should consider buying a facility of their own, which they ultimately did through the purchase of 57 acres and the mansion of the Coxe Estate in Malvern, a property which has since doubled in size. By this time Father Shealy was too ill to conduct retreats, and after consultation by the Retreat League leadership with Cardinal Dougherty, he appointed a Philadelphia priest, Father (later Bishop) Joseph M. Corrigan as spiritual director/retreat master. The impact of Cardinal Dougherty on Malvern to this day cannot be overestimated. Because at his urging the retreat house was owned by the Laymen’s Retreat League, not the archdiocese or a religious congregation, there was never the temptation to divert funding or sell all or part of the property to meet urgent diocesan or congregational needs. Just as important, the bishops of Philadelphia firmly controlled spiritual matters, which assured complete orthodoxy. For all of his perceived reputation for conservatism, Cardinal Dougherty was way ahead of his time. Malvern was also blessed by outstanding leaders and benefactors, just to name a few: Richard McSorley, a prominent attorney; William Lennox, long-time Philadelphia sheriff; the prominent builders Matt McCloskey Jr. and John McShain. All of them gave liberally of their time, talent and treasure. The original single building has been expanded to seven, with the most recent addition the McShain-Horstmann Center, which opened in 2003 and can accommodate many different types of retreats, including couples and family retreats. In the first year at Malvern there were 525 retreatants; four years later it was up to 1,877. By now there are 20,000 retreatants each year, of which only 9,000 in the traditional men’s weekend retreat. The rest include women’s retreats, youth retreats, specialized retreats and mid-week or single-day retreats. As the retreat movement in Philadelphia enters its second century through Malvern there is reason for optimism, believes Francis J. Marx, chairman of the Executive Committee. Following Malvern’s Oct. 28 Mass at the Cathedral there will be a luncheon at the Sheraton Philadelphia Downtown Hotel with Catholic ethicist George Weigel as the keynote speaker. He will also receive Malvern’s St. Joseph the Worker Medal along with John Smithson, senior vice president of St. Joseph’s University.